ATV Tube - walkaround videos and photo coverage from the Biggest All Terrain Vehicle Shows in USA and Canada !!! Here are our New Videos from 2016 Toronto ATV Show!!! Welcome to ATV Tube website. 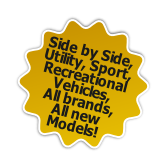 The term “ATV Tube” or “Us” or “We” refers to the owner of the website - AutoMotoTube Inc. The term “You” refers to the user or viewer of our website. - This website contains material which is owned by, or licensed to Us. This material includes, but is not limited to, videos, pictures, logo, the design, layout, look, appearance and graphics. Reproduction is prohibited other than in accordance with the copyright notice, which forms part of these terms and conditions. - All trade marks reproduced in this website, which are not the property of, or licensed to the operator, are acknowledged on the website. - Your use of this website and any dispute arising out of such use of the website is subject to the laws of Canada.